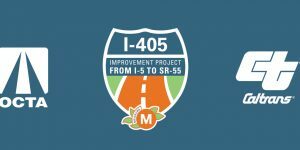 The Orange County Transportation Authority (OCTA) and the California Department of Transportation District 12 (Caltrans) are working together to develop, design, and construct the I-405 Freeway Improvement Project (Project) between Interstate (I-5) and State Route 55 (SR-55) in Orange County. During the Project Approval/Environmental Documentation (PA/ED) phase, three alternatives will be considered, including the “Baseline” or No-Build and Alternatives 1, 2, and 3. At the start of the project, freeway volume on this segment of I-405 was just under 355,000 vehicles per day (vpd). This vehicular demand is expected to increase nearly 13% by 2030, raising the freeway volume to over 400,000 vpd. 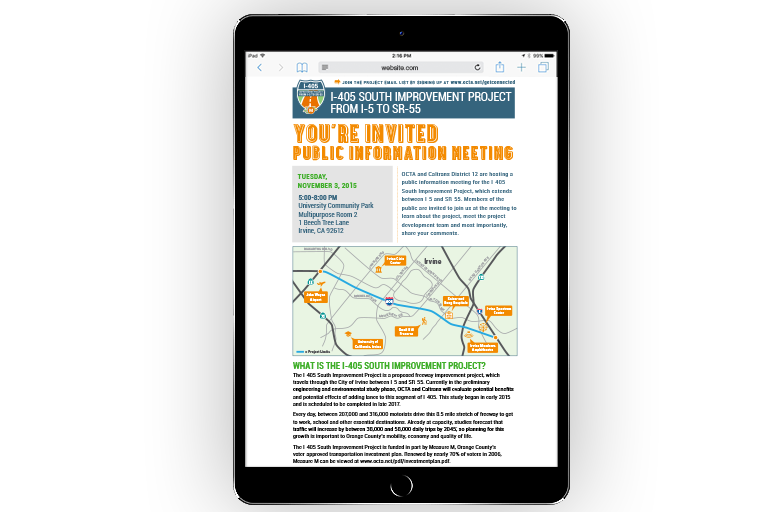 The project proposes to add new northbound and southbound lanes to I-405 from I-5 to SR-55 and improve chokepoints at interchanges. 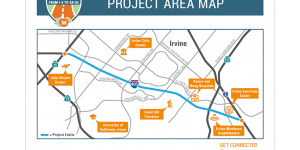 Additional capacity and operational improvements to improve the overall freeway operations in the I-405/I-5 El Toro “Y” area include the addition of merging lanes near on- and off-ramps at Lake Forest Drive, Irvine Center Drive and SR-133. 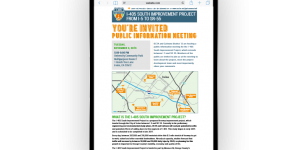 Caltrans in partnership with OCTA proposes to improve freeway operations, enhance safety, increase capacity and reduce congestion through implementation of this improvement project. Working in consultation with OCTA and technical team members, Circlepoint assisted in developing and implementing an effective public communications and community outreach plan which informed and engaged the community as the project advanced through the PA/ED phase and into construction. 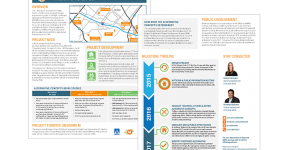 Circlepoint’s primary responsibilities included identifying and engaging target audiences and key stakeholders; developing project identity and branding; copywriting and collateral development (factsheets, e-newsletter, project website, presentations and lobby displays); planning and implementing open house and public hearing meetings; and assisting OCTA and Caltrans project managers with government and media relations.